Illinois' Becca Cuppy performs a routine on the balance beam against Minnesota at Huff Hall on Feb. 7. Cuppy is in her first semester at Illinois after graduating high school early. Freshman Becca Cuppy walked to the balance beam sporting a navy blue GK Elite leotard that had metallic orange ribbons and rhinestones scattered on it. She was finally wearing an official Illinois leotard. Cuppy didn’t care that her performance was just an exhibition. 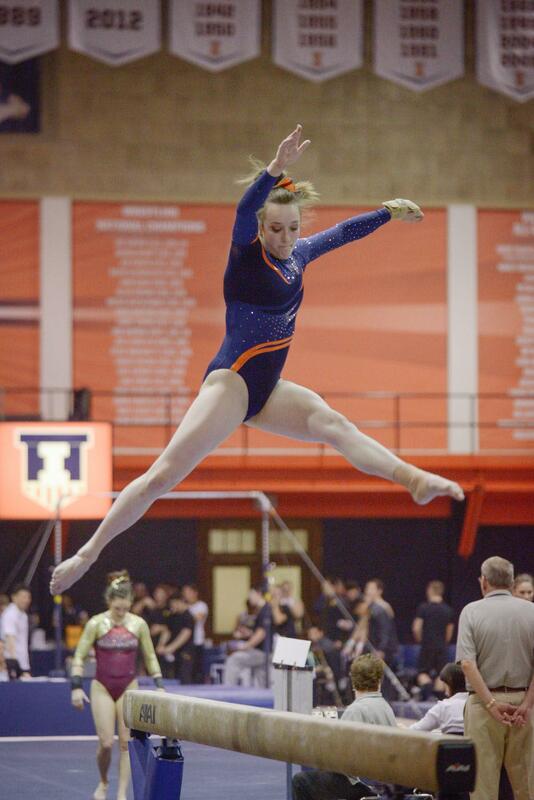 Standing up on that four-inch wide beam in front of the home crowd at Huff Hall on Feb. 7 was what she had been waiting for. That was the first time Cuppy performed in a competition for Illinois. She fell on a tumbling series in the midst of her routine, causing her to score a 9.100. But it was just an exhibition, so Illinois wasn’t counting it. The fall didn’t even diminish her experience, though. Cuppy still called her exhibition “amazing” and “so much fun,” and her teammates felt no different. What made it even better for Givens was the fact that Cuppy, who joined the team at the start of the year, was already making her mark. Cuppy skipped out on her last semester of high school, graduating from Ankeny Centennial High School in Ankeny, Iowa, in December. 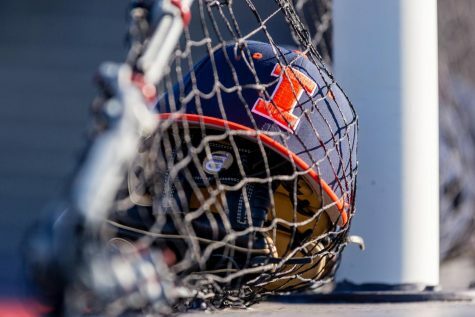 She signed her national letter of intent on Nov. 12 and later enrolled at Illinois for the spring semester, but it wasn’t her idea to come early. When she returned home from her visit to Illinois during her junior year, Cuppy took a trip to see her high school counselor. The two worked together and figured out how Cuppy could make her desire to enroll early a reality. Cuppy took online classes throughout her junior year, the summer and fall of 2014 to make up for her lost semester of high school. She admitted it was a lot of work, but it was worth it in the end, because it meant she got to compete in collegiate gymnastics. What’s interesting, though, is that the 17-year-old Cuppy hadn’t even considered competing in the NCAA until she had began competing level nine gymnastics, around the time she was 15 years old. When Cuppy’s club teammate Kara Lovan — now a sophomore — committed to Oklahoma, Cuppy realized she wanted to follow in Lovan’s footsteps and be a collegiate gymnast. Afterwards, Cuppy searched for colleges where she could continue her gymnastics career for another four years. Illinois happened to be the perfect fit for her. Cuppy had nothing but an endless amount of good things to say about Illinois. She sees beauty in its campus, and the emphasis on academics and athletics is exactly what she was looking for in a school. But before she arrived at Illinois, she had to deal with a stress fracture in her left foot. On Sept. 12, Cuppy found out she had the injury, but it had been nagging her for months. She doesn’t know exactly when it occurred, but pain began to linger in July. Cuppy returned to gymnastics in January, and her training has consisted of beam, floor and uneven bars. Bars isn’t an event she’ll be competing this year, but she has performed the beam twice in exhibitions. In Illinois’ 196.500-196.325 win over Michigan State on Friday at Huff Hall, Cuppy improved upon her first beam exhibition, scoring a 9.675 for her beam routine. She has yet to compete a floor exhibition, but Landrus mentioned it’s a possibility once her routine is ready. Despite the fact Cuppy hasn’t officially competed yet, Illinois is still glad to have her. Landrus likes Cuppy’s potential to become a good all-arounder and the difficulty she brings on beam and vault. Givens agreed with her coach, saying Cuppy’s beam routine is “beautiful” and that it’s highlighted by her great lines. Givens continued saying, “she’s good everywhere” even though Cuppy hasn’t trained for all events yet. Cuppy’s quick transition from high school and club gymnastics to collegiate gymnastics hasn’t been difficult. She already feels adjusted and is looking forward to what Illinois has to offer her.